In the past few years, the hype that surrounds sneaker culture runs rampant with special events like Sneakerpimps and alpha male posturing, making it easy to forget who pioneered high end sneakers. Sure, a man with 100 pairs of sneakers is suspect (of many things), but as effeminate as some males are with their kicks, they are, as a whole, nowhere near the as obsessive as their female counterparts. 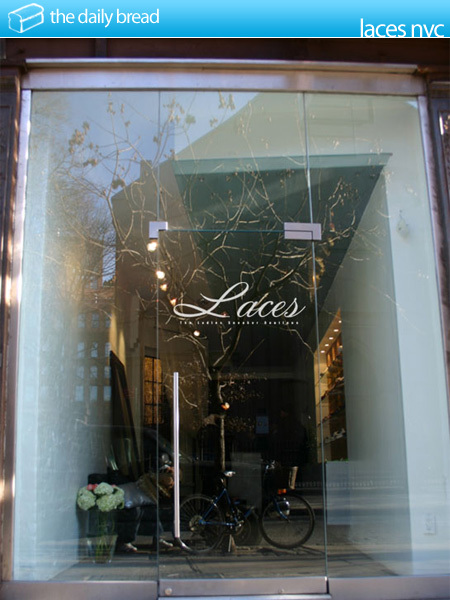 Catering to sole licking women in New York City, Laces, a recently opened Manhattan boutique, takes note of what women really want! Laces aims to fill the gap within the urban market by providing athletic and stylish sneakers to women that choose sneakers over stilettos. 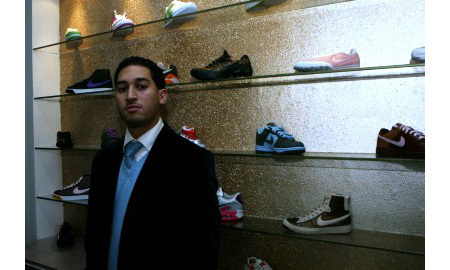 Format takes a minute with Lacesâ€™ owner, Louis W. Colon III, to discuss Lacesâ€™ place within the male dominated sneaker culture. Format: Youâ€™ve mentioned that you never worked in retail before laces. How did you go about learning the ins and outs of the business, how long did it take you? Louis: No, I never worked in a retail store before, so I had to learn the old fashion way. I had to research and find out what it takes to run a store on a daily basis. It took me a couple months to figure it all out, but to be honest there is still plenty I need to learn and am still learning today. Format: Whatâ€™s one of the most important lessons youâ€™ve learned and whatâ€™s the most recent lesson youâ€™ve learned? Louis: The most important lesson I learned is how to balance being a boss that leads and can also discipline at work. The second most important is to know your customer and be selective on what product is brought into the store. Format: How instrumental was Nikeâ€™s Priscilla Shumate in the development of Laces or, if not her, who is someone who has been instrumental in the development of Laces and why? Louis: Meeting Priscilla was big for me just because it validated that someone who worked with the swoosh was interested in the concept. My family has been the most instrumental in helping make Laces come to life. My sister designed the store, my brother helped me out with everything and my parents just gave me the support I needed. Format: You also run Kicksclusive magazine. How, if at all, have Laces and Kicksclusive become integrated or worked to each otherâ€™s advantage? Louis: Kicksclusive and Laces wonâ€™t become integrated, but they do work to each others advantage, simply because of the relationships that each individually builds. Format: Please explain the store and the vibe someone might get from coming into Laces. Louis: I hope that the Laces experience is one that women remember and then look to Laces as their source for sneakers. The vibe we hope to set is one of good customer service and quality products. Format: How, if it all, is selling sneakers to women different than selling to men, specifically in a boutique setting? Louis: Women are much more sophisticated shoppers then men are. Women have so many options for footwear, so they are able to compare, price, product and customer service. Men are more simple when they shop. They find what they want and simply buy it, customer service and ambiance don’t matter â€“ all that matters is buying those kicks. Format: Youâ€™ve mentioned that you donâ€™t want to label the store streetwear. How would you classify the store and what in the store reflects that classification? Louis: The streetwear label doesn’t fit the Laces brand and to be honest I don’t think it fits most streetwear brands. The streetwear labeling limits designers and buyers and this whole culture is built from being self aware and unique. So as this label is blanketed across the market, you will begin to see the more visionary brands separate themselves by making quality goods. When there is a clear difference in goods, the consumer will then become more knowledgeable, and this will change the streetwear label forever. Format: To what degree does male sneaker culture play a part within Laces? For example, what percentage, if any, are the shoes in the store made for men, but you adopt them as female shoes? If you do this, how do you decide that a shoe is more female, do any men shop at your store? Louis: Sneaker culture is pushing companies to produce better goods and that helps Laces, because women want top quality and edgier product. The womenâ€™s sneaker market is underserved, will continue to grow as the menâ€™s market grows exponentially. I don’t buy any menâ€™s styles in the store â€“ itâ€™s 100 per cent womenâ€™s products. Format: Describe your general consumer? Louis: My customer is a fashion forward urban lady that is not afraid to wear kicks with an outfit that is usually hooked up with shoes. Format: What will it take to get women more interested in sneaker culture, what is Laces doing to fuel the culture? Louis: It will take consistent product to get girls to continue to be loyal customers. Laces is presenting sneakers on a different platform than Athletes Foot or Footlocker does, so it brings more value, and separates who is the athletic customer and the fashion customer. Format: Youâ€™ve mentioned the development of a Laces clothing line. Can you speak about the development of that? Louis: The Laces line is coming in May and itâ€™s going to grow from the store as a small T-shirt brand and will evolve to a full line later on. As the store grows, the line will grow, as well. Our collection for the first year is an Ode to Iconic women, so our graphics will tell a story to pay tribute. Format: Have you run into any issues being a man running one of the only female sneaker boutiques? Louis: No, I haven’t run into any issues. To be honest, when people see me working at the store they just assume I just work here and Iâ€™m cool with that. Format: Where is Laces located and why did you choose that particular location? 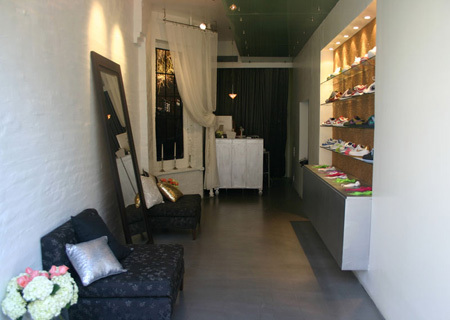 Louis: Laces is located on 252 Mott St. between Houston and Prince in SOHO/Nolita area. I chose this location specifically, because the block is full of womenâ€™s boutiques. So, women on the block are shopping for jewelry, shoes, clothing, lingerie, and now sneakers from Laces. Format: Whatâ€™s next for Laces? Louis: Laces is going to do a bit of spring cleaning. For starters, we are launching the Laces line and bringing in clothing from brands such as Palis Womenâ€™s, Hellz Bellz and Brinka. Also, bringing in a really good selection of sneaker product from Creative Recreation, Etnies Plus, Alexander McQueen and Puma, and Nike [and] that will totally separate Laces from everyone else. Lastly, we are adding in Laces kids, with footwear for toddlers from Creative Recreation and Nike.